Is Your TMR Getting Weighed Accurately? 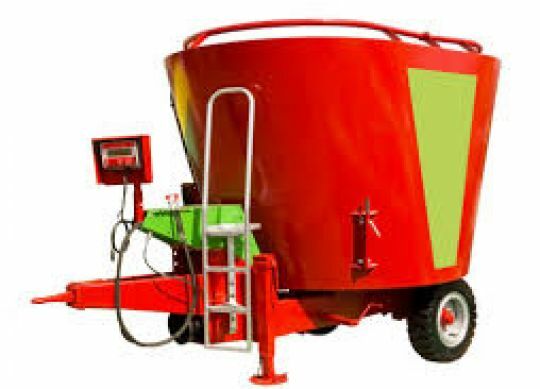 Three main companies in the U.S. market load cells for on- farm mixer wagons: Avery Weigh-Tronix, DigiStar International, and Dinamica Generale. Representatives from these companies state that load cell accuracy is +/- 1%. For example, a load of TMR may weigh 26,000 lbs as displayed on the scale head monitor mounted on the mixer versus 25,800 lbs when the load is pulled across a certified truck scale. The difference of 200 lbs is less than the specified limit of 260 lbs, which means the load cells are weighing accurately. However, if there is a discrepancy in the weights larger than 1%, then it’s a good idea to check individual load cells to find any that are malfunctioning. weights of the ladder and person hanging on the ladder. We conduct this test when the wagon is both empty and full to make sure the load cells are accurate across a wide range of load weights. Shifting weights due to moving mixer parts and wind effects on the mixer box can cause rapid and huge changes in the digital scale readings, which makes it difficult to load ingredients and confirm target weights. To combat this problem, the sensitivity of the load cells is reduced so that the digital scale reads in increments of 10 lbs, making it easier for the feeder to read the scale and load the mixer. A reputable scale company in the Upper Midwest suggests that load cell accuracy should be +/- one increment. In other words, all the load cells on a mixer should read the same weight in increments of 10 lbs. Another issue is controlling the allowed weight instability during unloading. One of the most common indications of weight instability is when the feeder makes multiple pen drops and finds out that there isn’t enough feed left in the mixer for the last pen – as much as 500 to 1000 lbs short! Why is this? Due to the nature of unloading (where the feeder might unload more or less than the target drop) the feeding software must recalculate the remaining target drops based on what is remaining in the mixer. To do this, a new weight is requested from the mixer before the start of each pen. If weight stability is not controlled, these new weights can be significantly inaccurate because the mixer is moving quite erratically (accelerating, turning, driving over cattle guards, etc. ), resulting in inaccurate unload amounts. To control the weight stability, allowed motion or movement settings can be set on the mixer or in the feeding software which require stable weights. Additionally, ‘Pauses’ can be implemented which gives the system an opportunity to get the new weight left in the mixer only after the mixer is positioned and stable at the beginning of the next pen. Check with the feed software company for this feature and learn how to turn it on. We conducted a survey of load cell accuracy on 25 mixer wagons represented on 19 different dairies in Eastern Wisconsin. The survey was done in collaboration with CP Feeds, a regional feed company, which provided a customer list for us to contact the dairies. We used a ladder fabricated with a large hook to place over the top edge of the mixer box. The hook was large enough to fit over the rubber extension and not slip off the mixer box. We placed the ladder directly over the top of each load cell. Then one person hung onto the ladder and the second person read the weight on scale head digital display and recorded into a spreadsheet on an iPad. The survey included a variety of mixer wagon types (horizontal and vertical) and brands. Most of the wagons had load cells mounted horizontally on the frame (measuring bend of the load cell); however, there were a couple of horizontal-type wagons where the load cells were mounted vertically (measuring compression of the load cell). All of the mixer wagon brands used load cells from one of the three major manufacturers. Each load cell was uniquely identified by the manufacturer for easy tracking when a customer called for technical support and/or calibration. Out of 101 load cells in all of the wagons tested, 29 load cells were out of tolerance or deemed faulty. Call the mixer dealer for assistance. If the dealer does not have the expertise to fix or to calibrate the load cells, they will call a certified scale tester for your area. These companies certify truck scales for accuracy and can certify mixer wagons. Perform monthly maintenance on the mixer to replace knives as needed, check wear on kicker plates and augers. If you have a certified truck scale, check the load weight of the TMR against the net weight of the load on the truck scale. The difference in these two weights should be 1% or less. If the readings are not consistent, then check for individual load cells that may be faulty or not reading correctly. Power wash mud and feed from underneath the mixer box, then check for any broken or kinked wires connected to the load cells. Make sure the load cells are mounted in the proper position (check the owner’s manual or check with the dealer).